What's Wrong with the Assemblies of God? Wayne Hughes is the General Superintendent of Assemblies of God in New Zealand and was one of the Church leaders who, together with Ian Bilby, former President of the New Zealand Elim denomination, endorsed the visit of Rodney Howard-Browne whose "laughing revival" has caused so much division among Churches and Christian families in New Zealand and Australia. 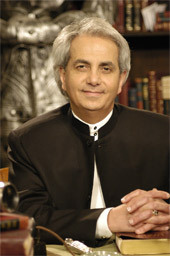 The New Zealand Apostolic Superintendent also endorsed Rodney Howard-Browne, BUT is not listed as endorsing Benny Hinn. 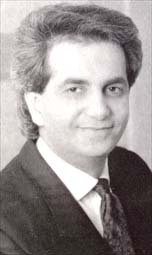 CWM alerted Wayne Hughes to the fact of Benny Hinn's documented necromancy in late January or early February '98. Despite this he has continued to endorse Hinn and his ministry, although it is rumoured that he is concerned that he might be doing the wrong thing. For the record we have published a copy of the relevant email. Our strong recommendation to all Christians is that you do not participate in any supportive way - by means of donations or otherwise - in the Benny Hinn Crusade or to the Benny Hinn Ministries. John the apostle of our Lord Jesus Christ wrote: - "Whoever transgresses and does not abide in the doctrine of Christ does not have God. He who abides in the doctrine of Christ has both the Father and the Son. If anyone comes to you and does not bring this doctrine, do not receive him into your house nor greet him (bid him God speed - AV) for he who greets him shares in his evil deeds (biddeth him God speed is partaker of his evil deeds - AV)" - 2 John 9-11. This is THE WORD OF THE LORD. The following was supplied by Michael Oppenheimer, Let Us Reason Ministries, HAWAII on Philip Powell's request following a report that Benny Hinn had caused a great deal of trouble in the islands following his Honolulu Crusade in March, 1998. 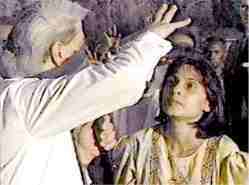 Taken from a Benny Hinn programme - "THIS IS YOUR DAY" - June 11, 1997 - also repeated at a recent Benny Hinn PARTNER CONFERENCE in Atlanta. "Ladies and gentlemen, I'm going to tell you something right now. The Lord showed me a vision about - goodness it's almost been a year now. And - (I) can tell you I sense now the time has come when this vision is gonna be fulfilled. I had a vision of the night. What I saw, myself walk into a room. I've shared this before but just in case you - you've not heard it I want you to hear it. I saw myself walk into a room and there stood Kathryn Khulman. And I've not seen Kathryn in a dream or a vision [in] years. Uh, when she died, the day she died, the morning she died, I had a dream what I - what I saw in a - in a - in a - in a casket with a white dress. And when I woke up in - in the morning, I knew she had died and it was on the news that same morning. And so it's been many years. And there she was standing in this room and she said to me-of course this was a dream, but really more of a vision. A lot of times! dreams are really visions of the night, and the Bible calls them that. When - when God gives to you in the fashion it really came with me. I know you may - you may think I lost my mind, but the lord said, 'ELIJAH the prophet" ...Seven and half years ago, just before the ministry started, before these crusades began, suddenly in front of me I saw a group of people. I couldn't even tell you who they were. I recognized only one of them. It was Miss Khulman. And every one of them seemed to be urging me to pray. Now I know this sounds crazy, but it's all right. I don't mind if you call me crazy, because I liked what I saw. And this - this group was saying, now I couldn't hear them. I'd been in prayer at least, uh, hours. And suddenly, just - just this flash came in front of me. I can not describe it to you except to tell you it was more real than you sitting right in front of me right here. It was not a mental thing. It was so alive, pastor. It's so alive. It was like a flash of lightening hit me and all I saw was these people's faces. I will tell you, when I get to heaven. I will recognize them (at least fifty to seventy of them were sitting a group), and they were saying to me, "Pray! Ask God to give you a healing ministry that will touch the world!" And suddenly, I heard Kathryn's voice, [Hinn snaps fingers] and out of the blue, suddenly there - there she was, it's crystal clear. And she in her beautiful smile, the way she said, "Ask! We're waiting for you to ask! We're praying with you to ask " And the vision disappeared. And suddenly I said, "Lord!" and I asked. A week later the anointing hit my life. I believe the saints in heaven urge us to pray. Urge us to do it! Do you know why I believe it? "One of the strangest experiences I had a few years ago [was] visiting Aimee's tomb in California. This Thursday I'm on TBN. Friday I am gonna go and visit Kathryn Khulman's tomb. It's close by Aimee's in Forest Lawn Cemetery. I've been there once already and every so often I like to go and pay my respects 'cause this great woman of God has touched my life. And that grave, uh, where she's buried is closed, they built walls around it. You can't get in without a key and I'm one of the very few people who can get in. But I'll never forget when I saw Aimee's tomb. It's incredibly dramatic. She was such a lady that her tomb has seven-foot angels bowing on each side of her tomb with a gold chain around it. As-as incredible as it is that someone would die with angels bowing on each side of her grave, I felt a terrific anointing when I was there. I actually, I - I, hear this,' I trembled when I visited Aimee's tomb. I was shaking all over. God's power came all over me. ... I believe the anointing has linged over Aimee's body. I know this may be shocking to you. ... And I'm going to take David (Psalmquist) and Kent (Mattox and Sheryl Psalmquist) this week. They're gonna come with me. You-you-you gonna feel the anointing at Aimee's tomb. It's incredible. And Kathryn's. It's amazing. I've heard of people healed when they visited that tomb. They were totally healed by God's power. You say, 'What a crazy thing.' Brother, there's things we'll never understand. Are you all hearing me?" Benny Hinn Prophesies That God's Glory Will Visibly Appear as Fire in the Sky! 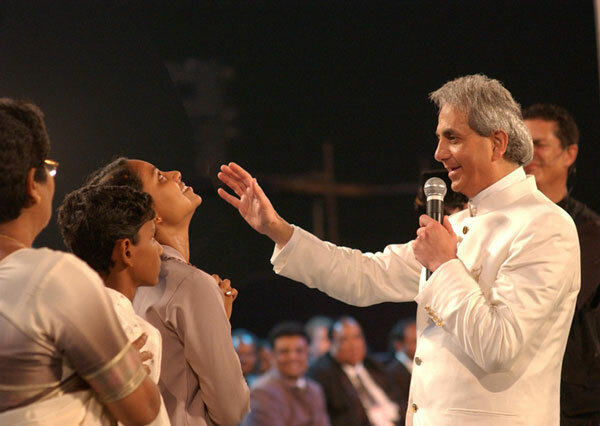 Is Benny Hinn Teaching The Real Presence Of The Catholic Mass? 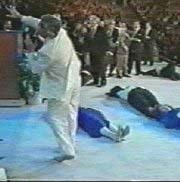 Benny Hinn's Prophesies For 2003 Fail! The Dead Resurrected By TVs Tuned To TBN!